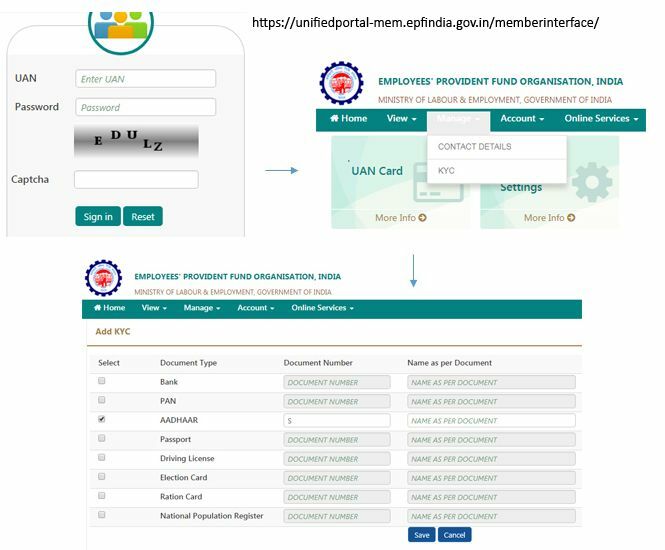 Home » Personal Finance » How to link Aadhaar to EPF Online on UAN Portal? It has become mandatory to link Aadhaar with your EPF account. If you are wondering how to link Aadhaar to EPF (Employees Provident Fund), account this post is for you. Here is a step-by-step guide that will help you to link your Aadhaar card with to EPF. Why to link Aadhaar to EPF? Visit Unified Member Online Portal. Login to your EPF Account using UAN, Password, and Captcha. Click on “Manage” tab. From the drop-down menu select “KYC’ option. A “KYC” update window allows you to update a range of documents like a bank account, PAN card, Aadhaar, Passport Number, Driving License number, Election card as specified by EFPO. For linking Aadhaar with EPF account click on Aadhaar and enter your Aadhaar number and name as appearing on Aadhaar document. Click on save button once you are done. Note- You may face issue while updating your Aadhaar. The reason could be a mismatch between your credential provided to the UIDAI and EPFO. Mainly change of name etc. After saving data it will be visible under tab “Pending KYC”. It generally takes 15 days to get it approved from an employer. On approval, your Aadhaar will be visible in “Approved KYC” tab. In the village area where Internet facility is not available. In a case where KYC is not getting approved by the Employer. In case of technical/system related issues. For linking Aadhaar with EPF offline EPF subscriber or pensioner can walk in any of field offices of EPFO or CSC outlets with UAN & Aadhaar and link the Aadhaar with the UAN. I hope information given above will help you in linking Aadhaar with EPF. « Bluechip Stock – Should You Invest in Bluechip Stocks? I’m not able to update my KYC, after filling the Adhar number and Name as per documents, once i click on the save, the error coming like invalid gender authentication fail. You need to verify Gender given on UAN and Aadhaar before linking. It should be same. Sir I have left my company a year ago now I want to withdraw pf money…. I have uan number and after log-in when I add aadhar number in KYC SECTION but more than month gone it is still pending please suggest me hassle free process to link aadhar to uan…. For me to go employer is not possible and presenlty I am studying not working. Another Alternative is to visit EPFO with valid document proof for linking Aadhaar with UAN. I am facing this issue ” You may face issue while updating your Aadhaar.” The reason could be a mismatch between your credential provided to the UIDAI and EPFO. Mainly change of name etc.” as in my pf account name anil sharma,but in aadhar it is anil Shankar Sharma. Now how to update this ? in my pf account fathers name is missing. You need to correct details at all place.Name should be same on PAN, Aadhaar and UAN. My name in adhar card was written in small letters but EPFO is accepting only capital letters.. So I am unable to update aadhar-card number… Please suggest me solution..
You can enter in Capital Letter.If required you can update detail on Aadhaar Card.